Our road trip began in New York City and took us to Boston, Pennsylvania, Nashville, Memphis, New Orleans and Houston en route to our final destination, Austin, for the 2015 United States Grand Prix. A big hurricane had the same destination in mind. It wasn’t easy getting into Circuit of The Americas. We had to collect our parking passes at the press center, then leave our car in a huge lot. Everything was fine apart from the ominous, heavy clouds in the sky. They were nothing like the ones we had seen along the road to Austin, when we had experienced beautiful autumn weather. It was Fabiana Valetti, Toro Rosso’s press officer, who first told us about the hurricane which was storming towards the region. That would add something to the show, I thought rather flippantly. I settled into my normal F1 routine on Thursday and Friday. I had organized an interview with Günther Steiner, the would-be Team Principal of the Haas team which was due to Formula 1 the following year. We enjoyed a long and entertaining conversation in the Ferrari motorhome. I ate lunch and engaged in some small talk with colleagues in the paddock and press centre. 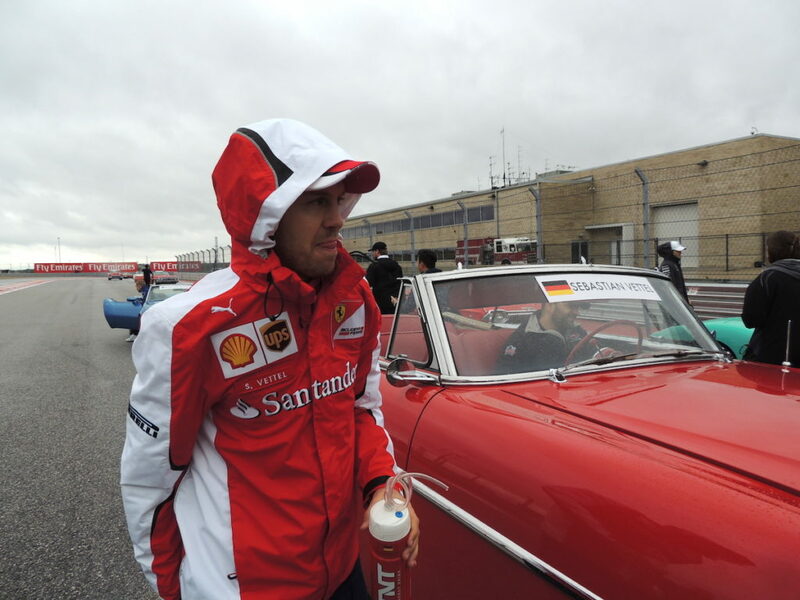 The rain hit the circuit just before the beginning of the second Formula 1 free practice session on Friday. I was forced to stay in the Toro Rosso motorhome as the conditions worsened outside by the minute. When Carlos Sainz and Max Verstappen came in from exploratory laps, it was clear that it would be a longer wait than expected. We ended up spending the rest of the afternoon at Toro Rosso enjoying their hospitality! Team boss Franz Tost even made an appearance and told everyone to enjoy themselves as much as possible. The Dutch contingent had their own table and the Verstappen’s were hosting Jan Lammers, who I decided to target for an interview. He happily accepted and we had an enjoyable hour recalling his active F1 years in the early 1980s. He even let me in on the secrete that he was selected to replace Gilles Villeneuve at Ferrari after the Canadian’s tragic death in 1982, but had broken his thumb in Detroit and was passed over in favour of Patrick Tambay. Meanwhile the weather outside did not ease at all. There were rumours that the authorities were going to close certain sections of the highway near the track, so we decided to pack up and head to our typical American-style motel some 20 miles away. We drove home through heavy rain and driving wind. When we turned on the TV in our room, it became evident that the hurricane, which had been baptised Patricia, was more serious than expected. The local police gave regular updates on road closures and advised people to stay at home if possible for the whole of Saturday. It was clear that Saturday’s on-track sessions at Circuit of The Americas would be affected. This became official when the organizers sent out a press release explaining that it was impossible to reach COTA due to the severe weather conditions, and that the track would be closed for Saturday. We went to the already-depleted local supermarket to stock up on food and drinks and then barricaded ourselves in our room. We sat in front of the TV on Saturday, monitoring the situation. We saw fields and streets under water, cars swept away and animals rescued. We also saw Circuit of The Americas and its inundated surroundings. My colleagues from Hungarian TV went to the circuit and reported the situation as disastrous. The third practice session went ahead with no spectators at the circuit and after multiple false starts, Nico Rosberg took pole position in a shortened version of qualifying without Q3. Everybody hoped for an improved Sunday with the race going ahead at the scheduled time. Miraculously, it did go ahead. Grey skies and mud everywhere. It was also freezing. I pitied the poor grid girls shivering away in their tiny outfits. The race went ahead with no issues. Lewis Hamilton overtook his Mercedes teammate Rosberg to claim the win and secure his third World Championship. Patricia stormed on and we said bye to Austin. Read our United States Grand Prix travel guide. Karoly accurately described the stormy condition that weekend. I was bit pessimistic on Sat that the raceday would have been cancelled by local authorities. But heaven opened its door on Sun to see Lewis winning his third title.